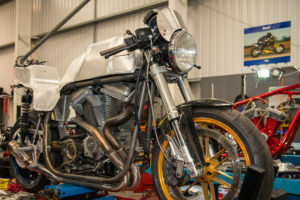 It’s been a long time coming but Nigel’s “Burton” Buell-Norton Franken-Buell finally burst into life on the bench over at JWA Motorcycles at Bromborough. Proprietor John Wynne has been busy completing the myriad tasks required to get it running and ready for the MOT. Although a little different to the pre-war and vintage fare we like this bike very much and have been following the build with interest. 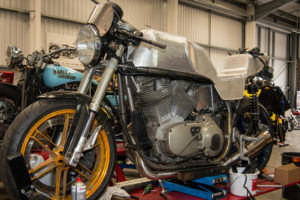 I have to say the bike is looking very nice indeed and I’m looking forward to a test ride before the bike is torn down for painting, plating and finishing. This entry was posted in Bikes and tagged Buell, Norley, Norton by Dodson. Bookmark the permalink. Looking good. I have a Buell powered Metisse and have been looking out for an update on this. Is there any other info on line? The bike is coming together really well now and is actually a runner, MOT’d and all. 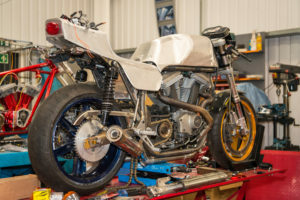 This is purely a dry build stage and Nigel has already started making changes prior to stripping for painting and plating. I’ll try and post some pictures but I’m away touring South America until end of January. I’d love to see some pictures of your Metisse if you want to email me some and a bit of information I’ll put a post up.